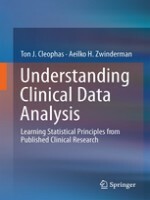 This textbook consists of ten chapters, and is a must-read to all medical and health professionals, who already have basic knowledge of how to analyze their clinical data, but still, wonder, after having done so, why procedures were performed the way they were. The book is also a must-read to those who tend to submerge in the flood of novel statistical methodologies, as communicated in current clinical reports, and scientific meetings. In the past few years, the HOW-SO of current statistical tests has been made much more simple than it was in the past, thanks to the abundance of statistical software programs of an excellent quality. However, the WHY-SO may have been somewhat under-emphasized. For example, why do statistical tests constantly use unfamiliar terms, like probability distributions, hypothesis testing, randomness, normality, scientific rigor, and why are Gaussian curves so hard, and do they make non-mathematicians getting lost all the time? The book will cover the WHY-SOs. This book uses the best-help-there-is for making the difficult issues understandable by using real data examples rather than hypothetical examples complementarily to real data examples. In addition to this, it continually gives a philosophical treatise of the basics of the scientific method as well as explains all of the novel issues of clinical data analysis from the past few years.